Primary Care Progress (PCP), in partnership with the American Medical Student Association (AMSA) hosted National Primary Care Week (NPCW) October 8-12, 2012. Primary Care Progress is a growing network of primary health care clinicians, trainees, and students engaging their local primary health care communities to promote primary care and transform care delivery and training. NPCW 2012 "Primary Care: The Future of Health Care" focused on voicing the value of primary care in the U.S. health system. NPCW provided students, trainees, clinicians, and primary care supporters from around the country an opportunity to organize local activities in academic and non academic primary care communities. Participants in NPCW addressed the challenges, as well as the opportunities, that they face within their local communities. 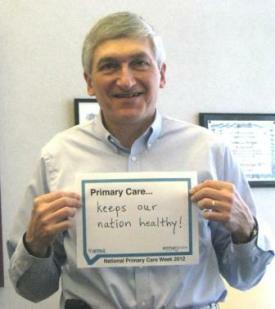 ACP Executive Vice President and CEO, Steven Weinberger, MD, FACP participated in the Voices of Primary Care photo sharing campaign as part of PCP's National Primary Care Week. More information on how medical students can get involved with Primary Care Progress is available online: http://primarycareprogress.org/home.